The global superabrasives market was valued at US$ 2.4 Bn in 2017 and is anticipated to expand at a CAGR of approximately 6.0% during the forecast period, according to a new report titled ‘Superabrasives Market: Global Industry Analysis, Size, Share, Growth, Trends, and Forecast, 2018–2026’ published by Transparency Market Research (TMR). The report infers that the use of superabrasive reduces lead time and provides better dynamics such as high surface sustainability to structures vis-à-vis conventional superabrasives. This is expected to drive the superabrasives market during the forecast period. Asia Pacific and Europe are leading regions of the superabrasives market. 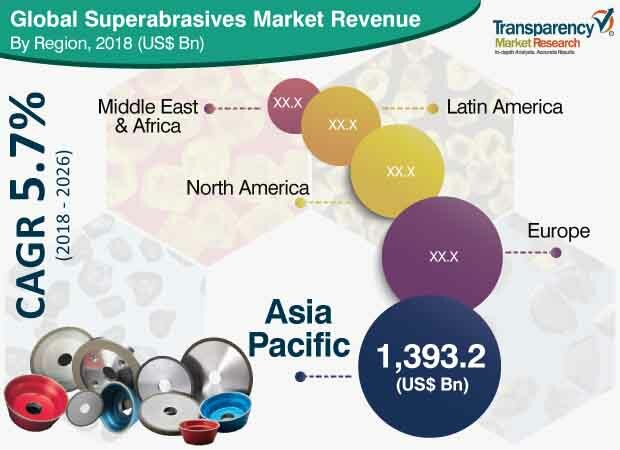 The superabrasives market in Asia Pacific is projected to expand at a significant pace during the forecast period, owing to the rise in demand for passenger vehicles in the region. Superabrasives play a vital role in the manufacture of grinding wheels and tools. These help improve productivity and efficiency of grinding processes. The role of superabrasives materials is to enhance the grinding system by optimizing the grinding power for the manufacture of automotive components. Purchasing power of people has increased due to the rise in per capita income. This is driving the global demand for vehicles. For instance, the global sales of vehicles increased by 3.07% in 2017. This propelled the demand for superabrasives. The process of vehicle restoration has increased owing to the increase in road accidents. This, in turn, is fueling the global superabrasives market. Superabrasives are also used for better finishing of surfaces and addressing tough component requirements in the automotive sector, due to the increase in demand for electrical and fuel-efficient vehicles. Additionally, superabrasives are employed for the development and manufacture of high- performance vitrified diamond grinding wheels for bruting applications. In transmission systems, superabrasives are used for the finishing of gears in order to lower the sound of the gearbox. The report presents a detailed segmentation of the global superabrasives market based on material and end-user. In terms of material, the cubic boron nitride segment constituted major share of the global superabrasives market in 2017. Cubic boron nitride materials are insoluble in nickel, iron, and equivalent alloys at higher temperatures, while diamond is soluble in these metals. Cubic boron nitride materials are also used for machining various materials such as high carbon and alloy steels; non-ferrous metals and alloys; and other non-metallic materials. Additionally, they provide higher thermal stability than diamond and are ideally used in grinding, polishing, lapping, and honing of ferrous materials. Polycrystalline cubic boron nitride, the other form of cubic boron nitride, is most widely used with materials such as carbon steel, cast iron, heat treated steel, sintered metal, and super alloys. In terms of end-use, the automotive segment is projected to account for dominant share of the global superabrasives market during the forecast period. The segment is likely to expand at a significant pace from 2018 to 2026. Superabrasives materials help enhance the grinding system by optimizing the grinding power for the manufacture of automotive components. Demand for superabrasives products in the automotive industry is expected to rise due to the high demand for precision grinding of surface, improved surface quality, and superior surface finishes. Asia Pacific and Europe were key regions of the superabrasives market in 2017. The superabrasives market in Asia Pacific is anticipated to expand rapidly owing to cross-border investments and business expansion of companies in high-growth areas such as India and Southeast Asia. Rise in population, rapid urbanization, and robust economic growth are major macroeconomic drivers of the superabrasives market. Asia Pacific leads the global superabrasives market, owing to the increase in demand for vehicles in the region. This can be ascribed to the growth in per capita income and increase in purchasing power of people in emerging economies in countries such as China and India. Superabrasives are extensively employed in finishing. They are used to coat the cutting edge of saws, which are used to cut cement in highway construction and repair work. Major players operating in the global superabrasives market include Element Six (UK) Limited, Henan Huanghe Whirlwind Co., Ltd., ILJIN DIAMOND CO., LTD., Saint-Gobain S.A., SHOWA DENKO K.K., Hyperion Materials & Technologies, and Zhengzhou ZZDM SUPERABRASIVES CO., LTD. These players offer sustainable and durable solutions to clients. Innovation of new products and techniques through R&D is one of the approaches adopted by these companies.